Projects will be selected to teach sewing principles and skills and coordinated with the student's interest. We will be making a handy-dandy thread catcher and pin cushion that sits conveniently by your machine or work area. Join us for some fun for National Serger Month with Baby Lock! Learn about our amazing sergers and the new additions to the Baby Lock Serger Line UP!! Make a fun project and some great new sewing friends! Spend a few hours learning about the hot new craze in quilting: Rulers! Join Mary Hyatt, a national Westalee Educator, as she demonstrates how easy and fun ruler work can be on your home machine. 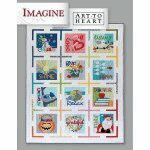 This block of the month will be from the "Imagine Quilt" book by Nancy Halvorson. 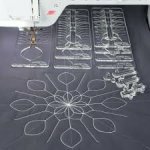 Kimberbell has created 12 different projects that are great opportunities to learn paper piecing techniques. These monthly projects are perfect for pin cushions, mug rugs, hot pads, shelf pillows, mini quilts, etc. Come start, finish, get help or just get away and sew with others during our Open Sew time. This class gives the beginning quilter an opportunity to learn different block designs and quilting techniques. Need time to finish your project without the distractions of home? Come use our class room where we can be of service to help in anyway possible. Learn new ways to use your Westalee Template Sampler Set in borders and sashing while making a placemat. Come join us this summer for our Buck a Block program.